Unique Fighter action featuring heroes and villains from the DC universe. View larger 20+ playable characters. Injustice: Gods Among Us debuts as a bold new fighting game franchise that introduces a deep, original story featuring more than 20 fan favorite, and other less well-known, DC Comics icons such as Batman, Superman, Wonder Woman, The Flash, Harley Quinn, Solomon Grundy, Nightwing, Cyborg and others. Set in a world where the lines between good and evil are are blurred, players will experience heroes and villains engaging in epic battles on a massive scale. Developed by NetherRealm Studios, under Ed Boon of Mortal Kombat fame, Injustice: Gods Among Us is developed with gamers of all skill levels in mind. 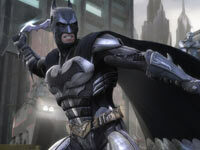 The playable characters are separated into roughly two categories: power based fighters such as Superman, and gadget based fighters such as Batman. 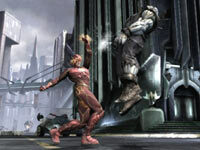 In the interactive environments of the game a power character like Superman might use his super strength to lift and throw an object such as a car at an opponent, while a gadget character like Batman might maneuver an opponent close to the same car, then blow it up with a tossable explosive. Characters like Wonder Woman Woman and Nightwing have hybrid abilities that they can toggle between. Regardless of the characters used, varied abilities makes each a possible match for the other, with their attacks broken down into heavy, medium and light varieties, and each also having a specific move that can be unleashed when the power meter that they grow throughout combat, is full. 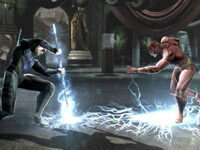 In addition, players can engage in “wager battles” in which portions of the opposing character’s power can be won as a prize for victory. Taken together these mechanics promise action that is simple to pick up but challenging to master, and and which adds a distinct gameplay feel. View larger Accessible controls and attacks. View larger Robust multiplayer support. View larger Fight arenas from each franchise.